Aaron Smyth has left Cliftonville just hours after the Reds signed former Glentoran full-back Jamie McGovern. McGovern was a free agent after he was not offered a new deal with the Glens last month. "He is still a young man but he's been playing Irish League football for a few years so he has plenty of experience," said Reds manager Tommy Breslin. But his arrival was quickly followed by Smyth, also a full-back, leaving the club by mutual consent on Friday. McGovern is the second close-season signing for the Solitude side, following the arrival of goalkeeper Conor Devlin last week. 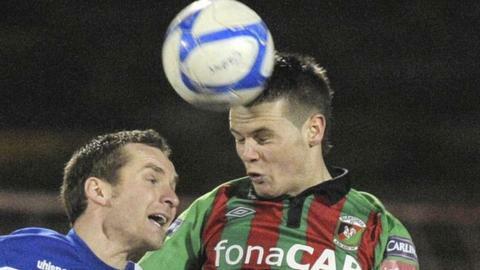 McGovern made 136 appearances for Glentoran after joining the east Belfast club in 2007.